1. 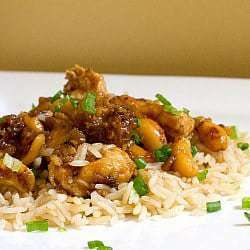 In a medium bowl, toss the chicken with the sherry, ginger, and 1½ teaspoons cornstarch; season with coarse salt. Refrigerate for 30 minutes. 2. Meanwhile, in a small bowl whisk together the chicken broth, soy sauce, rice vinegar, sugar and 2 teaspoons cornstarch. Set aside. 3. In a large nonstick skillet over medium-high heat, heat 1 tablespoon of vegetable oil. Add half of the chicken and cook until golden brown and cooked through, about 5 minutes. Transfer the chicken to a plate and cover with foil. Add 1 teaspoon of oil to the skillet and cook the remaining chicken (reduce the heat if the chicken is over-browning). Transfer to the covered plate. 4. In the same skillet, add the remaining teaspoon of vegetable oil. Add the cashews, garlic, and green onion whites. Cook, stirring constantly, until the garlic begins to soften, about 30 seconds. Whisk the sauce again to combine and add to the skillet along with the chicken. Cook until the sauce thickens, about 30 seconds. Serve over rice or noodles and top with the green onion greens.